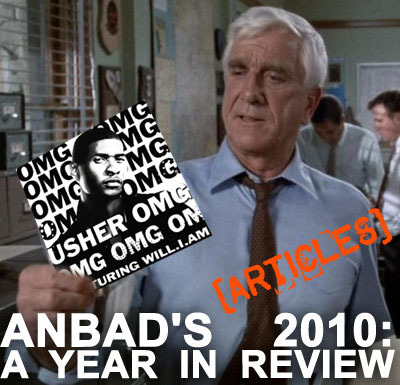 Before thoughts turn to further gluttonous over-consumption during the forthcoming New Year’s celebrations (and before you have to wade through acres of tedious ‘Hot Tips For 2011’ articles), how about one final glance back over some of the writing that was on ANBAD, but not directly about a specific new band? The Trouble With Live Gigs [Part One and the even less balanced Part Two], garnered agreement and angry rebuttal, eventually resulting in Peter Marinari’s excellent riposte. A very worthwhile read. Phew. And that’s yer lot. Normal ANBAD service will resume in the New Year. Have a great weekend! Posted on December 30, 2010 by Joe Sparrow. This entry was posted in Featured, Featured Articles, Headline. Bookmark the permalink. ← TV-Ad Competition Update! Plus! Bonus Best-Of-2010 Band!